holy hotdogs! (one of the new toddler friendly swears we’re trying out) thanks so much for all the HILARIOUS comments on the butterfly. some of the best comments ever! sorry I’m so pokey in posting a big fat thank you but I’ve been working at, well, a snail’s pace over here. Your bugs are gorgeous! I never thought I’d like a snail so much. Please tell me they’re going in your pattern book. Please? And if so, can I reserve a copy today? HaHaHa! He is sooo handsome. He reminds me of Robin Hood. I really like these little critters. I also love the backdrop (one of my favorite children’s books!). The cutest snail I’ve ever seen! Cute, cute, cute. Love ’em. Now, there is one snail I would love to find in my garden! I hope you do a pattern.My girls are snail mad! I love your snail! I keep saying I’m going to whip up some felt banana slugs (I think I’m the only human being alive who thinks they’re cute…), and haven’t had the time/inclination yet. Thank you so much for sharing your creativity with us all! Pupa-larva was more than incredible…. and snail tops even that! Just adorable!!!! I want one!!!! Awesome. that’s all I have to say…except…banana slugs? ew. sorry. STOP IT ALREADY!!! I just recovered from the last one! Perhaps a children’s story forming around this? wow hillary the snail even tops the butterfly which i didn’t see how you would ever do, especially a day later!!! i say children’s book for sure! you are a craft robot! it’s so fun watching your craftspurt. ya never know what you’re going to come out with next! oh, and monkeylickin’ is also a good toddler-friendly curse. i don’t believe i stubbed my monkeylickin’ toe! You know how when you see an adorable kitten or some little baby’s toes, and you just want to eat them? Like, you really, really want to take it in your mouth and BITE? Well, your things make me want to punch someone in the face. That’s how cute they are. I want him, I want to decorate my bedroom in wee wonderfuls bugs. Do you think I could convince my husband? STOP IT! I think it’s the “hat” that gets me. A braided snail. There is a first time for everything–which happens often at Wee Wonderfuls! I love him (her?). How can you sleep at night, knowing that you torture so many women with your cute lil creatures! Really, some of them are begging you to stop!! The sheer delightfulness of each one tugs on some of the harder to reach heart strings and they don’t always get enough exercise to sustain such a fabulous display of wonder without some cramping. Tomorrow could you maybe show us something less endearing (that will be tough you could make trash look adorable)? I know, maybe you could make something poorly or with really tacky fabrics!! I think we could all use a day to recooperate! On second thought I would certainly miss it these sunny pictures too much then I would suffer withdrawls! I guess you better not take any time off then … sorry! so… have I mentioned my small snail collection? yours is by far the sweetest I have ever seen and I am sooooo hoping that it will be in your pattern book. I always arrive so late to your comments page it’s all been said before, but hey I’ll say it anyway. Is there NO END to the reserves of your imagination?! Do you cook dinner at night staring into space spinning new creatures in your head? How do you have time to parent when you are always doing something new and wonderful? Wow and wow. And yes yes yes, please make a pattern book! I’ll bguy them for all my friends (event he ones who can’t sew). My boys want your bugs! They plead and beg me for them..
Aww Hillary you are a genius – so cute! All I can say is ‘awwww’. How freakin’ cute! Oh, I like the snail even better than the butterfly! His face looks as though he is trying so hard as he trudges along. You really have to stop 😎 or my list of projects to-do will just grow longer and longer. I love his uneven antennae. OMG, the cuteness is never ending. Stop this madness before I go overbored and start trying to cuddle with my laptop. must….stop…pointing…and giggling…at funny little hat…. this is really TOO MUCH in the best possible way! This is soooooooo cute!!!!! You really did a great job!! yes, indeedy on the pattern book. i would like to reserve my copy now! this little fella is too adorable! great work! Yay! A whole set of cute little guys! They’re adorable, esp. together. I like the background, very cheery with the colorful snail. That snail is the cutest. thing. ever! And try “Oh, sugar-foot!” That was my mom’s classic kid-friendly swear. All the kid-friendly in the world didn’t save us when we moved to a mining town in Nevada (I came home from school the first day with “I swear on a stack of bibles.” You can imagine where it went from there…), but “sugar-foot” was such a good one – I have such really fond memories of my mother saying that, somehow. It’s all too Wonderful! The previous transformation was divine. And now the phrase Holy Hotdogs, this site is always a delight to me. ps a belated thanks for the comment on my blog, was about to reply at the time and got so caught up in other people’s comments on your site that I forgot! Oh, Gosh, that is too cute! I love it! omg, I loved the butterfly…but I just might love the snail even more!! NO WAY! your cuteness quotient is off the scale! thanks for sharing your fabulous creations. Must. Own. Snail. Seriously. So cute! 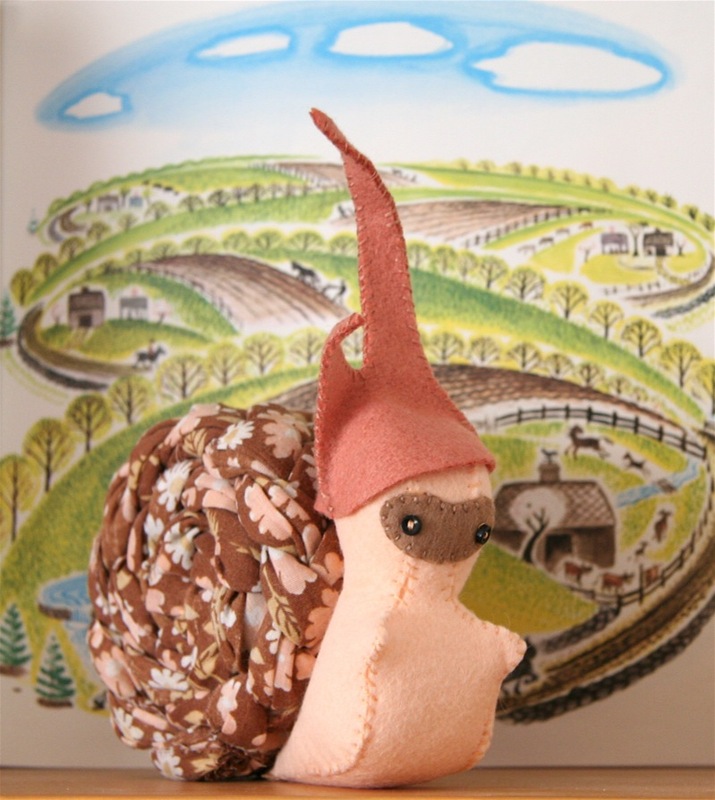 I have been all about snails lately and therefore must have a snail. And a red-capped mushroom to park it under, but I can take care of that part. We like “Shitake Mushroom!” (from Madagascar Peguin short). I have been loving newest creations. Thanks! I don’t know how you do it, but these keep getting cuter! the shell is incredible!! holy smokes.. This just couldn’t be any cuter!! Oh my! You’re killing me! Okay, I think the snail just became my favorite. MORE adorableness! More adorable-er? I am running out of superlatives here! You are INSPIRING, sweetie! Okay I want to be Hillary when I grow up these are just toot sweet! GOD BLESS AMERICA! Thanks for that one, Blair. I love this beautiful snail!! I love all your creatures. But this one is so specially creative. Adore him.